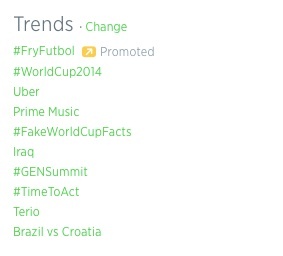 If you’ve logged onto Twitter this morning, you may have noticed that the top trend is a promotion called #FryFutbol. Nothing unusual, right? It’s the first day of the World Cup, so it makes sense that a brand (in this case McDonald’s) would advertise to piggyback on an enormously popular sports event. Here’s what is a little unusual: The Promoted Trend is apparently showing up on the homepages of Twitter users in 57 countries. Ross Hoffman, Twitter’s director of US brand strategy, said this is the first truly global Promoted Trend on the service. While the trend may get promoted at slightly different times in different countries, and while there will be a bit of localization and customization, the gist of the promotion is the same everywhere — it’s telling users to download McDonald’s Gol! app, which combines French fries with the iOS and Android camera to create an augmented reality soccer game. Our ambition is to deliver a truly unique digital experience for our customers with the McDonald’s GOL! Trick-shot app. Twitter has become a companion to live viewing, especially during major sporting events like the World Cup. Through our activation on Twitter, using the hashtag #FryFutbol, fans can connect in real-time during the tournament and join the conversation and excitement surrounding the World Cup. Hoffman noted that the World Cup is particularly suited for this kind of promotion because of its 32-day duration — McDonald’s can run the global campaign today and then follow up with more local efforts throughout the event. What Twitter can say is that Promoted Trends (which aren’t, in aggregate, Twitter’s biggest moneymaker) are particularly prominent on the Twitter homepage — they’re probably the closest thing Twitter has to the homepage takeovers that other websites can offer advertisers. And this is the first time a brand has promoted a trend in every country where it’s available. Beyond advertising, Twitter has also said that for this World Cup, it’s bringing back “hashflags” to help fans show their support for their favored countries.